Another way of looking at consciousness with an analogy on awareness. Consciousness is not something that comes up in conversation too often or ever for that matter. Frankly not many people are interested in the subject. I think we can all agree however, we would like to be happier. Raising our consciousness is part of uncovering the happiness we already possess. To understand consciousness one must understand awareness. If we are unaware of something how can we possibly know about it or learn more about it. People at lower levels of consciousness struggle a great deal with life because they are unaware. They are typically not very happy and seem to be caught up in the endless drama of life. As people move up into higher levels of consciousness, they become more aware of the world outside themselves. Life seems to take on a more purposeful flow. These people are much happier, more loving, content and peaceful. So there is a powerful motive to learn how to increase our level of consciousness and awareness. Just the act of exposing ourselves to certain material has the effect of raising our level of consciousness. At higher levels it is awareness on a deep level, a “knowing.” To help describe this concept we will look at the analogy of altitude or rising above something to gain more awareness, more perspective, to gain a better or clearer view. 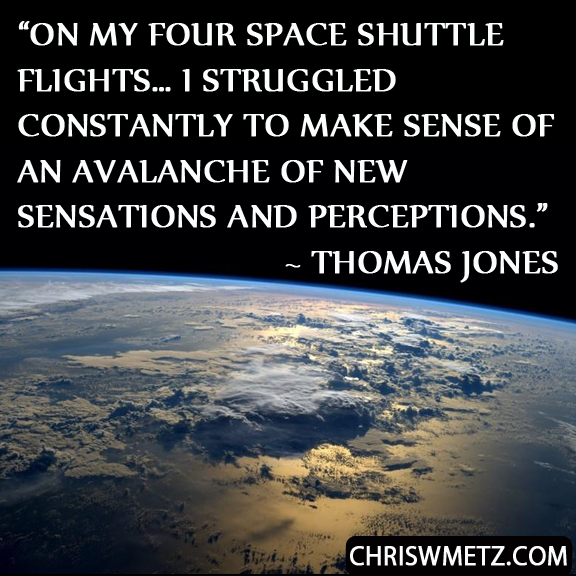 Every astronaut who has seen earth from the perspective of space had their consciousness raised to a new level. Once they came back to earth, they could never again experience earth or themselves the same way. 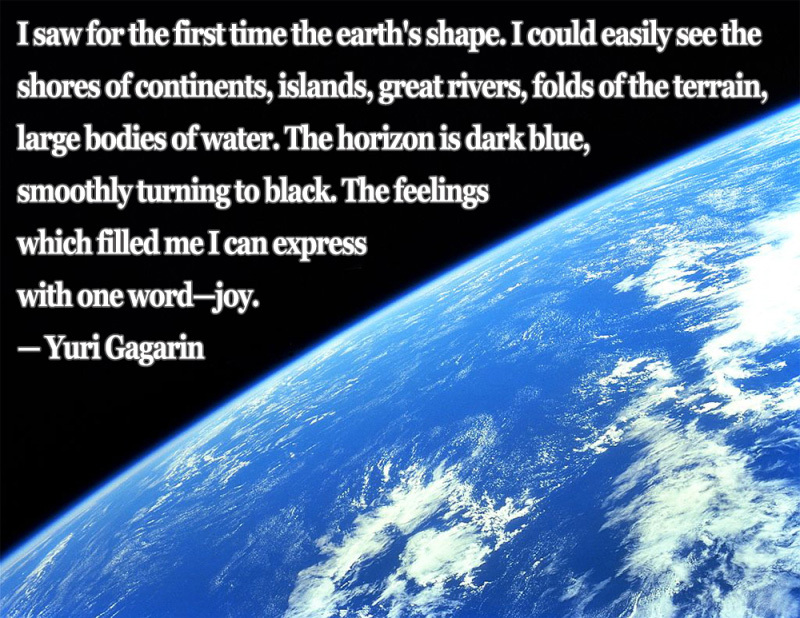 To see the totality of earth as a living blue orb in the dead of space, makes a person think on a different level. To begin with we are starting our journey on the ground. This represents the lower levels of consciousness. When we are on the ground we tend to only have awareness of what is immediately in front of us. The tendency is to react to things because we cannot see beyond our hand. It is like tailgating someone in traffic, we are so focused on the break lights of the car ahead, we aren’t conscious of anything else. We can’t see the bigger picture or other things happening beyond our immediate sight. So let’s say its the holiday season, you are in a crowded store of wall to wall people. You can only see the people that are right next to you. Suppose that someone pushes you and you end up bumping into someone else. That other person becomes very angry and yells at you. You become very angry because it was not your fault. Neither of you are aware of the wall to wall people in the store because neither of you can see the whole picture. You both start yelling at each other and neither person is willing to “let it go.” Since there is no where to go and no way to avoid this person a fight breaks out and you both get hurt. Both of you sustain injuries and bruises. As a result you both have a memory of pain, anger and hatred that you carry with you for the rest of the day and into the next week. You end up telling anyone who will listen about how some “idiot” got into a fight with you over being bumped. This becomes your focus for the rest of the day and a topic of conversation for the rest of the week. You literally hate this other person for what they did. Every time you think of this situation you become angry and upset. This obviously does not make you happy. As we rise up 5 feet in awareness we can now see how crowded the store is and we try to explain to the person it wasn’t our fault. You still yell back and forth but since you can see how crowded it is you “give in” and apologize. You are still very angry at this person and even though you apologized you only did so because they are an “idiot” for not seeing what happened. We are far enough above them that we taunt them a little with our arrogance pride and anger. We may be hurt by their words but we know more than they do and its not worth fighting. We spend the rest of the day telling everyone how we avoided a fight with some “idiot.” We were right and they were wrong. Since we feel “righteous” we mend easily “knowing” we were “right” in our view. As we rise up 25 feet in awareness this same encounter is no longer seen as threatening. We just apologize sincerely without trying to blame it on anyone else. Because we are so far above them they can’t possibly see the level of frustration of the crowd. We may be aggravated by the person for their complete ignorance but we no longer feel threatened by them. We see how there are many people getting pushed around and it is inevitable that someone is going to get shoved or hurt. We question how the management of the store could allow so many people in at one time. We start to think next year we will go earlier in the day before it gets too busy. As we rise up to 100 feet in awareness we see all the people pushing and shoving and start to see it as a sad statement on how materialistic the holiday has become. We see the chain of events that leads to a fight. We wish we could make them aware of the conditions because maybe then they would never have gotten into a fight. We are tempted to go down and explain to both parties but both are too mad to reason with. We may feel a certain arrogance or superiority at this level because we can see so much more than everyone else. As we rise up to 1000 feet in awareness we now see many people with many personalities each wired in their own way. Each is prone to certain characteristics and behaviors based on their personalities. We start to see people as they are more or less programmed to certain tendencies. We see all the drama that takes place because of these different personalities. None of these people see why they have conflict with others. Each individual thinks differently and responds differently to every situation. We avoid shopping altogether since we bought everything several months prior to the holiday. Once we have reached this level we can never look upon the situation on the ground in the same way, we are now changed with a new level of awareness. These changes in awareness occur as we continue higher from this point. As we rise up to 5000 feet in awareness we now see the entire town. We see the town culture and influence it has played on the people that live there. We see people doing bad things and we see people doing good things. These influences exist everywhere throughout the town. We see where a person lives, where they go and who they associate with affects who they are as a person. We witness people always trying to impress others. We see so many people trying to please others in order to be accepted. At 52,000 feet or 10 miles in awareness we can no longer see any people. We just know they exist among many living out their life, going through their habits and routines, experiencing their dramas day after day. We start to become more enamored with the beautiful view. We avoid conflict with anyone since each person has their own idea of what life is. No two people are the same so we don’t take things personally. Everyone is programmed to act in different ways and it has nothing to do with us. We start to see continents and different countries. Each country has their own unique culture, each with generations upon generations of tradition and ingrained beliefs. Each culture has their beliefs and those beliefs shape their lives, their experience and the country they live in. We see the resources they may or may not have and the great concentrations of wealth and poverty over expansive areas. Depending on what we pay attention to with our focus and telescopic concentration we can zoom in on anything we wish to see. If we wish to see crime, poverty and cruelty all we need to do is zoom in on it and we can see as much as we like for as long as we like. Likewise we can choose to see the silent and serene beauty of nature away from civilization. If we wish we can zoom in on people performing kind, generous and loving acts for others. There is either great collaboration or rugged individualism and strife, we alone decide which will be our focus. The view is breathtaking and we decide how we focus our awareness and what we wish to experience from our vantage point. We can go anywhere and do anything. Using our ability to focus our awareness, we can create the conditions to experience anything we desire. We see earth as blue orb. It appears as a living organism providing an environment where life thrives. 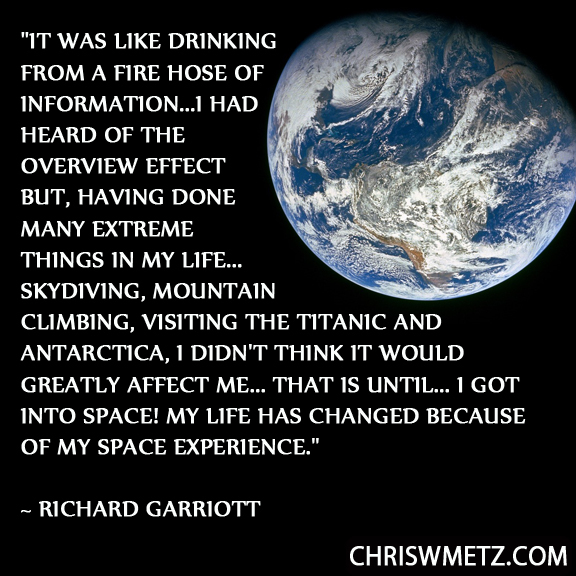 There is perceived good and perceived bad but from the view so far out in space it represents only an environment. There are countless causes creating countless effects. The nature of life on earth is things come into existence or experience birth, live out their lives and then die. From this view it is not difficult to see the light from the milky way or the lights from other galaxies where life evolves and inhabitants live or die together. The story of evolution is endless. We view all of this and we are at peace knowing this creative cycle is part of creation itself. We no longer see the drama of people, they are just one life form out of many. Humans are prone to their frailties, but love is what holds them all together. Without love humans would not survive. Earth is seen as a loving entity creating an environment where humans can experience love and happiness or pain and suffering. It is each individuals choice. We see the existing solar system in which earth resides. We see life is dependent on the right conditions with earth currently inhabiting the unique conditions for life to develop. At an early point in our solar systems 4.8 billion year lifetime, planets closer into the sun may have had the right conditions to support life. It is conceivable as our solar system ages and the sun expands, life may very well evolve on planets outside of earth. The scope, magnitude and age is almost incomprehensible. There is no more judgment of anything. Everything is perfect, everything is as it should be. We see our milky way galaxy with our small solar system representing just one of 200 billion solar systems capable of supporting life. We realize we are looking at history for if we could travel back to the nearest solar system, it would take 150,000 years to reach it at the speed of light. Some planets have undergone tremendous changes, whole species of life have come and gone. We think back to our drama on the ground and realize each person is only capable of being that which they are able to be. We realize our judgment of people is due to our own ignorance of this fact. People literally cannot help themselves for behaving the way they do. They are at a certain level of consciousness which does not allow them to be aware of themselves. This evolution of consciousness is occurring throughout our galaxy and throughout other galaxies. As each species evolves it goes through its animal phases of consciousness, then higher intelligence phases, finally reaching the highest levels of consciousness. Unity, compassion, cooperation, peace and love represent the end stages of consciousness for all evolved life forms. We see our galaxy as one of billions of galaxies spread across a cosmos 46 billion light years across. There is a sense of an intelligent creativity governing the laws of space with the creative destruction and rebirth of planets, stars and galaxies. Time stands still in the wonder and awe of creation. Evolution and life is on a continuous cycle of forming, evolving and perishing. Here we sit in the peace and love that is creation itself, we can feel a merging of our essence into the source of creation itself. We are in a state of absolute joy, love and peace. There are no more wants or desires, these have all fallen away. There is no more sense of an individual self. There is only a feeling of being one with everything. We no longer look upon any other person as higher or lower than us. We see each person as part of ourselves. There is nothing but compassion for all things as they are. 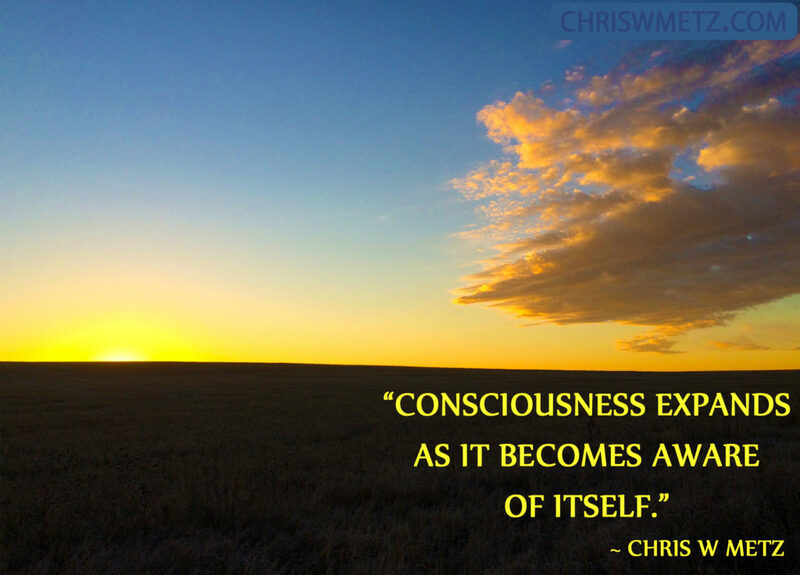 Here we understand the essence of consciousness is experiencing itself in every possible way. 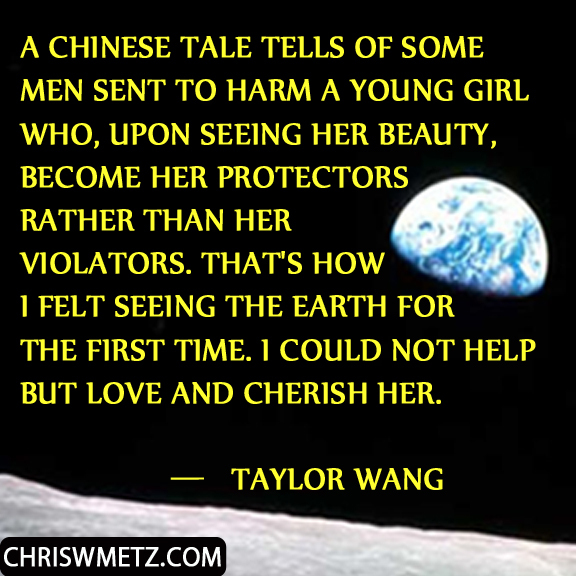 This provides the contrast for understanding the one true reality, which is love itself. Life is spiritual it has been and always will be. Perhaps the universe exist as a never ending cycle of big bangs expanding and contracting as if it were the creators heartbeat or breath. 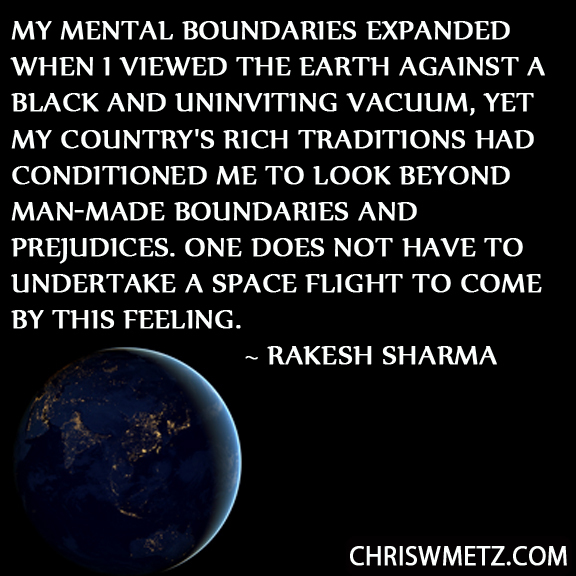 Returning to the ground of our own planet it is now difficult to function as a human being. Those who have reached the highest levels of consciousness can never again look upon the world or life the same way. The awareness they experience becomes a “knowing.” That “knowing” can never be taken away or lost, it becomes an integral part of us as a human. Additionally it is instrumental in the evolution of our soul. One is only left with a sense of love and peace which can not adequately be described nor comprehended by lower conscious forms. Most people who have reached the highest levels of consciousness on our planet, live out their lives in seclusion. Some become spiritual teachers and some elect to pass into the spiritual realm having transcended the human ego experience. Just being in the presence of a highly conscious individual has the effect of raising our own consciousness. The drama of evolution is before us. There is a process that must be gone through as each species evolves. There is no direct way to alter this process. Everything is in the process of becoming and everything is perfect in whatever state it is in. There is an inner calling inside all sentient life to evolve, to grow, to learn, to search inwardly to know itself. Inside we are programmed with all there is to know. Inside each of us the creator of life has planted the answers to life itself, but we must evolve, raising our level of consciousness, before we are able to access it. 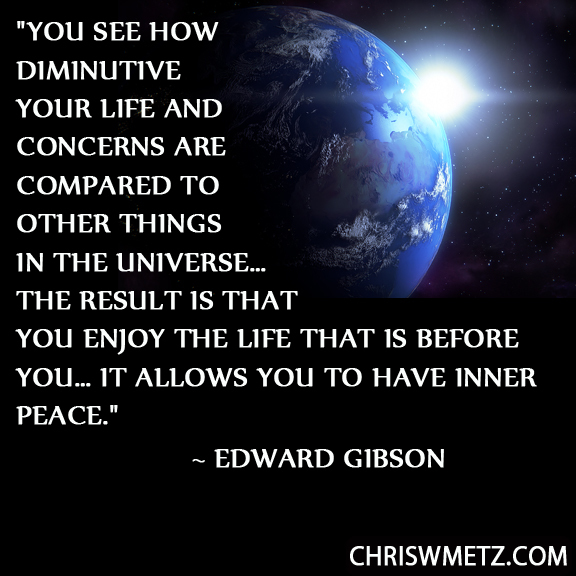 Can you see how viewing or experiencing things in your life has raised your level of consciousness? Going through some long term illness. Getting to the other side of something you had a deathly fear of. i.e. They made you think differently about yourself or your life. You experienced a view of things (perspective) from a different side you never had before. You changed a long standing belief. You let go of a fear. You went deep inside yourself to question the meaning of something. All changes in consciousness ultimately occur because of a change in our thinking. If we seek higher levels of consciousness on our own, we do so by searching for new ideas to change our thinking. We seek the deeper meaning of things. We go deep inside ourselves to understand who and what we are. We seek to uncover the “truth” about life. We change our awareness; we do not try to protect the illusion of who we are. The alternative is to allow life’s events to change our thinking through suffering, struggle and heartache. One is a proactive approach, the other is a reaction to life. One approach is evolutionary occurring over great spans of time. The other can occur in a miraculous moment of grace, the choice is ours to make. 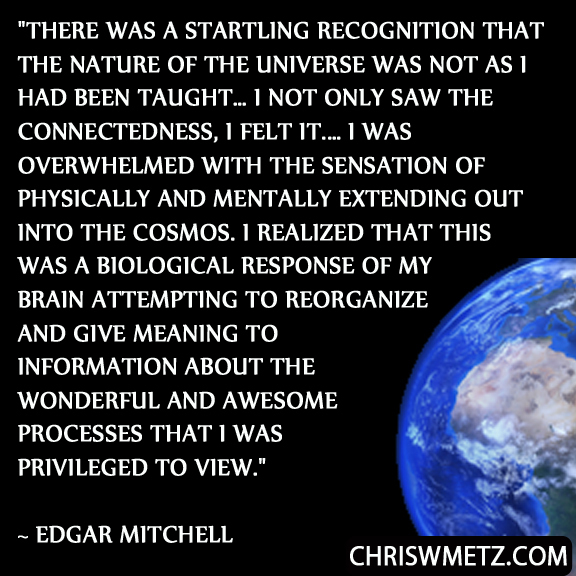 Gaining a higher level of consciousness is inevitable in the course of evolution. It will happen over a great expanse of time or it can happen rapidly. The choice is ours. In the next post in this series we will explore general levels of consciousness. To go there now click here. This entry was posted in Calming The Mind Within, Self Awareness and tagged consciousness, Happiness, Personal Growth, self-awareness. Bookmark the permalink.